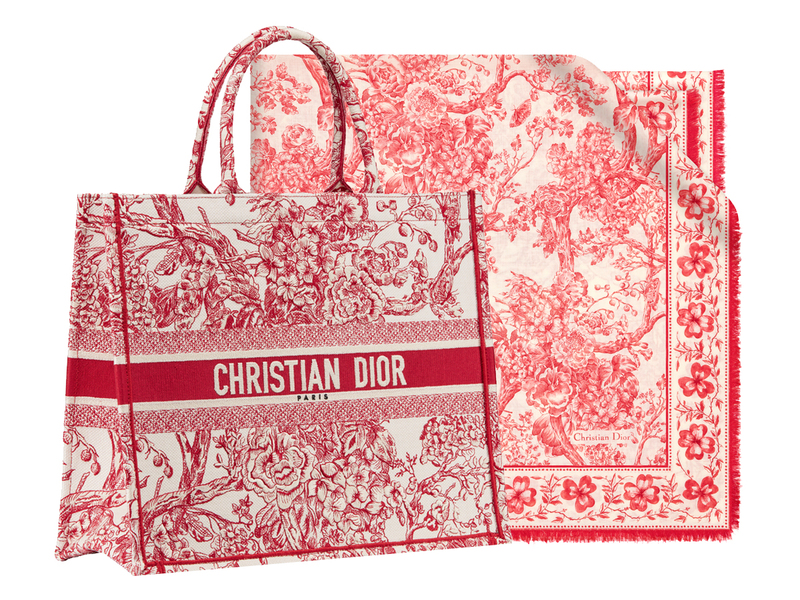 Walk into a Dior boutique today and you will see lovely red bags and accessories decorating the store, pieces which come in an all-new Toile de Jouy print that’s created specially for Lunar New Year. No, you wouldn’t find anything porcine-related (for that, you can refer to a different selection over here), but rather one that’s all about the colour red and all things floral, both of which are symbols of good fortune and eternal happiness. The limited-edition motif takes inspiration from the fabric found in Christian Dior’s very first boutique at 30 Avenue Montaigne, translated beautifully into a number of accessories, bags, RTW, SLGs and even sneakers. And because the range is pretty diverse, here are a number of must-have pieces (bags and SLGs, no less) which you should definitely keep an eye out for when you’re over at the boutique. Starting with two bags, both of which are Dior icons in their very own right. The Small Diorama (SGD6000) identified by the crest-shaped metallic clasp right in front, along with the Lady Dior Mini (SGD6300), both of which come with a silkscreen print and embroidered with a beaded hydrangea motif for an extra touch of luxury. Both bags come in pretty handy sizes of 21.5 cm by 13 cm and 17 cm by 15 cm respectively, which makes them perfect for all your house visits in the upcoming Chinese New Year. For those who prefer something smaller, you can consider the Diorama Clutch (SGD2600) that’s essentially a WOC which comes with 4 card slots, 1 flat pocket, a zippered compartment, and furnished with a 120cm removable chain. The Lady Dior Mini Wallet (SGD800) is also pretty handy, coming with 5 card slots, a slot for bills, another flat pocket for receipts and a zipped compartment for coins and keys. Alternatively, go for the pocket-friendly (both literally and figuratively) Lady Dior Cardholder (SGD500) which comes in off-white calfskin, with two card slots and a flat pocket, plus the D-I-O-R hang charms dangling by the side for a lovely touch.